The vortex dynamics at microwave frequencies in YBa2Cu3O7-δ (YBCO) films have been studied. We observe a peak in the microwave (4.88 and 9.55 GHz) surface resistance in some films in magnetic fields up to 0.8 T. This is associated with the ‘peak-effect’ phenomenon and reflects the order-disorder transformation of the flux line lattice near the transition temperature. Introduction of artificial pinning centers like columnar defects created as a result of irradiation with 200 MeV Ag ion (at a fluence of 4×1010 ions/cm2) leads to the suppression of the peak in films previously exhibiting ‘peak effect’. A pronounced peak in the microwave (at frequency 9.55 GHz) surface resistance, Rs vs. T plot (where T is the temperature) has been observed in epitaxial DyBa2Cu3O7−y superconducting thin films in magnetic fields (parallel to c-axis) in the range 2 to 8 kOe, and temperatures close to the superconducting transition temperature Tc(H). Our data suggest that the nature of peaks observed in the two films is different, thereby indicating different defect structures in the films. 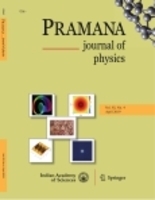 We report the observation of a propounced peak in surface resistance at microwave frequencies of 4.88 GHz and 9.55 GHz and its disappearance after irradiation with swift ions in laser ablated DyBa2Cu3O7-δ (DBCO) thin films. The measurements were carried out in zero field as well as in the presence of magnetic fields (up to 0.8 T). The films were irradiated using 90 MeV oxygen ions at Nuclear Science Centre, New Delhi at a fluence of 3×1013 ions/cm2. Introduction of point defects and extended defects after irradiation suppresses the peak at 9.55 GHz whereas no suppression is observed at 4.88 GHz. These results and the vortex dynamics in the films at microwave frequencies before and after irradiation are discussed. In this paper we report synthesis of phase-pure highly resistive magnetoelectric BiFeO3 thin films on Pt/TiO2/SiO2/Si substrate by using pulsed laser deposition technique. For the first time saturated ferroelectric hysteresis loop has been observed. It has confirmed the presence of ferroelectricity in BiFeO3 compound. The films exhibit dielectric anomaly near Neel temperature. This anomaly is related to the influence of vanishing magnetic order on the electric order. In situ domain alignment occurs during observation of the films under transmission electron microscope. In this paper, we report for the first time finite size effects on Néel temperature (TN) of magnetoelectric BiFeO3 system. Novel wet chemical route has been developed to produce fine particles of BiFeO3 with controlled size and size distribution. Unlike other oxide systems, lattice volume contraction has been observed with decrease in particle size. The decrease in TN is co-related to unit cell volume contraction occurring with reduction in particle size. Electrical resistance (R) measurements of a bulk La0.33Nd0.33Ca0.33MnO3 perovskite in magnetic fields up to 40 kOe have revealed anomalous temperature hysteretic effects both in 0 Oe and 20 kOe magnetic fields. The sharp peak observed in the R vs. T plot indicates the occurrence of metal-to-insulator (M-I) transition at a temperature of TMI=110 K and 140 K, for cooling and warming paths, respectively. An applied magnetic field of 20 kOe reduces the resistance and shifts TMI to 160 K and 185 K for cooling and warming, respectively. We have observed a much higher resistance in the cooling path than in the warming path leading to the hysteretic resistance ratio (Rcool/Rwarm) of 200 at 110 K and 1.8 at 160 K for 0 Oe and 20 kOe, respectively. Record values of colossal magnetoresistance (CMR) have been achieved. The CMR value reaches nearly 99% in the temperature ranges of 90 K to 140 K and 90 K to 170 K for 20 kOe and 40 kOe magnetic fields in the cooling mode, respectively. The observed unusual behavior is attributed to the co-existence of La-rich and Nd-rich domains assumed to be distributed randomly in the compound. Epitaxial La0.2Nd0.4Ca0.4MnO3 thin films have been deposited at 800°C on LaAlO3 substrate using pulsed laser deposition technique. The structural and magnetotransport properties of the films have been studied. The sharp peak in the temperature dependence of the resistance corresponding to metal-to-insulator transition (Tp) has been observed at a temperature of Tp=82 K, 97 K and 110 K for 0 Oe, 20 kOe and 40 kOe magnetic fields, respectively. The film exhibits a large nearly temperature-independent magnetoresistance around 99% in the temperature regime below Tp. The zero field-cooled (ZFC) and field-cooled (FC) magnetization data at 50 Oe shows irreversibility between the ZFC and FC close to the ferromagnetic transition temperature Tc=250 K. The ZFC temperature data of the film displays ferromagnetic behavior for higher temperature regime Tc=250 K&gt;T&gt;Tp=82 K, and a decrease in magnetization with decreasing temperature up to 5 K below 82 K exhibiting a sort of antiferromagnetic behavior in the low temperature regime (T&lt;82 K=Tp=TN). We have carried out extensive studies on the self-injection problem in barrierless heterojunctions between La0.7Ca0.3MnO3 (LCMO) and YBa2Cu3O7-δ (YBCO) thin films. The heterojunctions were formed in situ by sequentially growing LCMO and YBCO films on 〈100〉 LaAlO3 (LAO) substrate using a pulsed laser deposition (PLD) system. YBCO micro-bridges with 64 µm width were patterned both on the LAO (control) and LCMO side of the substrate. Critical current, Ic, was measured at 77 K on both the control side as well as the LCMO side for different YBCO film thickness. It was observed that while the control side showed a Jc of ∼ 2 × 106 A/cm2, the LCMO side showed about half the value for the same thickness (1800 Å). The difference in Jc indicates that a certain thickness of YBCO has become ‘effectively’ normal due to self-injection. From the measurement of Jc at two different thicknesses (1800 Å and 1500 Å) of YBCO films both on the LAO as well as the LCMO side, the value of self-injection length (at 77 K) was estimated to be ∼ 900 Å. To the authors’ best knowledge, this is the first time that self-injection length has been quantified. A control experiment carried out with LaNiO3 deposited by PLD on YBCO did not show any evidence of self-injection. La0.67Ba0.33MnO3 (LBMO) thin film is deposited on a 36.7°C SrTiO3 bicrystal substrate using laser ablation technique. A microbridge is created across bicrystal grain boundary and its characteristics are compared with a microbridge on the LBMO film having no grain boundary. Presence of grain boundary exhibits substantial magnetoresistance ratio (MRR) in the low field and low temperature region. Bicrystal grain boundary contribution in MRR disappears at temperature T&gt;175 K. At low temperature, I-V characteristic of the microbridge across bicrystal grain boundary is nonlinear. Analysis of temperature dependence of dynamic conductance-voltage characteristics of the bicrystal grain boundary indicates that at low temperatures (T&lt;175 K) carrier transport across the grain boundary in LBMO film is dominated by inelastic tunneling via pairs of manganese atoms and tunneling through disordered oxides. At higher temperatures (T&gt;175 K), magnetic scattering process is dominating. Decrease of bicrystal grain boundary contribution in magnetoresistance with the increase in temperature is due to enhanced spin-flip scattering process. Microwave surface resistance (Rs) of silver-doped YBa2Cu3O7-δ (YBCO) thin film, deposited by laser ablation technique on 10 mm × 10 mm LaAlO3 substrate, has been measured by resonant techniques in the frequency range from 5 GHz to 20 GHz. The geometrical factor of the sample and the resonator has been determined theoretically by the knowledge of the electromagnetic field distribution in the resonators. The microwave surface resistance of the superconducting sample is then extracted from the measured Q value as a function of temperature. The sensitivity of the Rs measurement, that is, the relative change in the Q value with the change in the Rs value is determined for each resonator. Hole-doped rare-earth manganite La0.7Ca0.3MnO3 and the electron-doped manganite La0.7Ce0.3MnO3 both show a metal-insulator transition around 250 K associated with a ferromagnetic transition and colossal magnetoresistance. In an earlier publication we have reported the rectifying characteristic of La0.7Ca0.3MnO3/SrTiO3/La0.7Ce0.3MnO3 tunnel junction at room temperature, showing that it is possible to fabricate a diode out of the polaronic insulator regime of doped manganites. Here we report the magneto-transport properties of such a tunnel junction above and below the metal-insulator transition. We show, from the large positive magnetoresistance of the tunnel junction at low temperature, that La0.7Ce0.3MnO3 could be a minority spin carrier ferromagnet. The implication of this observation is discussed. We report here injection of spin-polarized carriers from a half-metallic La0.3Ca0.7MnO3 (LCMO) colossal magnetoresistive (CMR) thin film into a high-temperature superconducting YBa2Cu3O7-δ (YBCO) thin film studied using a micro-bridge. The LCMO and YBCO films were grown on 〈100〉 LaAlO3 (LAO) substrate sequentially using pulsed laser deposition (PLD). I-V measurements carried out at 77 K show that while normal critical current, Icn, of the micro-bridge is 80 mA, the critical current, Icp, through the micro-bridge when injected from the CMR layer is 38 mA. This clearly shows that spin-polarized quasiparticles injected from the the CMR layer into the YBCO layer suppress the critical current of the superconductor via the pair-breaking phenomena.